I made this in a roleplaying forum, and it was really great! Well, this roleplay takes place in a mangrove swamp (O RLY! ), and the storyline is yet to take form. You must play as a pokemon, you dont have levels, and your moveset must be possible. You cant for example know both whirlwind and drill peck, you cant know HM moves if you are a wild pokemon etc. Read the rules? Lets start then! Slayer was confused. Until now he had been his owners favorite pokemon. But then his trainer heard about more advanced battling, and things like physical/special, sweepers and tanks, and EV training. Since slayer didn't have a good moveset for any categories, and couldn't be EVtrained, He suddenly found himself released. He sat down and thought for a while, and then he remembered his ancient past, the time before getting brought back to life. Back then, there were no humans. Just wilderness. Swamps, forests, deserts. No one told you what to do. You were free. He was the terror of the rivers that time. Swimming without making a noise. Sneaking up to unexpecting Meganiums and attacking them without mercy. He really deserved the nickname "slayer", although the human that named him didn't know anything about this, and made the name just because it sounded cool. Then Slayer made a decision! He was in a city! A place build by man, imprisoning the earth. This were no place for a free predator. Humans can have their stinking cities, but a vicious predator like slayer need soft soil under his feet. Slayer started walking, searching for a way out of the city. Half an hour later, Slayer still walked around in the city. IT was quite huge, and he couldn't find the city walls anywhere. He slashed the head off a taillow, and started eating it, still looking. But as you may understand, a predator with scythe hands aren't really a common sight in a human city. Neither is it a welcome one. Soon the city rangers pursuited him, wanting to catch him and make the streets safe again. Slayer heard a faint noise. He turned around, and saw several armored men with nets. He started running in the opposite direction, because he knew what those men where. He had seen them before, when he was with his ex-trainer. He saw the way come to a dead end, but he didn't stop. Instead he tackled a garbage container, bounced back, flew over the city rangers and climbed up at a roof. The rangers weren't late to follow, and soon they chased him from roof to roof. He started getting tired, and suddenly tripped. He fell off the roof and landed in a pile of garbage. He heard the rangers, got to his feet and started running again. He ran through the labyrinth of old, filthy houses, and suddenly he saw the city walls. He got new hope, and started running faster. Risked a glare backwards, and found out that the rangers had recieved reinforcements. They threw a net against him, but he cut himslef loose and ran faster..
three yards left.. two yards left.. just six steps left to reach the freedom.. five.. four..
Slayer suddenly tripped, and fell down. He hit the hard street, and rolled into a wall. Suddenly, a gas grenade srtiked the ground behind him. The shock wave threw himaway, and he rolled closer to the city gate. He turned his head and used a mud shot attack, and flew out. He landed in a mud puddle, used his last powers and crawled in between some trees where the rangers couldn't see him. He fell asleep immidietly. Slayer opened his eyes. It was bright. Where was he? This wasn't a pokeball, neither a computer box. He opened them a bit more. Green.. Trees? Then it cant be a rest house either. He looked around, and saw the surroundings. Huge trees with roots going down to the water.. Muddy, filthy water.. Remoraids jumping around shooting down volbeats and illumises. A grimer sitting by the waters edge and drink.. He understood that he was in a Mangrove Swamp. Then he remembered yesterday. Remembered the wild chase. Remembered that he was free.. free..
Last edited by ArtisticPlatypus on Thu May 03, 2007 12:07 pm, edited 3 times in total. He was Abandonned into this mangrove swamp, so he was trained. PS: Don't worry, I'm experienced with role plays, I'm in riolu's adventure and poke wars and I'm currently running unforceen havoc. EDIT: Fixed my mistake and gave him confuse ray. Last edited by Blazikendude on Sat Apr 21, 2007 4:20 pm, edited 1 time in total. Hm.. Iäd like to hear a longer story than "He was Abandonned into this mangrove swamp, so he was trained. " More details, more "living" text. Then you may join! He was abandonned in the swamp bacause he would make creepy noises at night so the trainer couldn't sleep, he also was disobedient in battle, always doing what HE wanted. "wild pokemon" was short and could've been longer, but it pretty much covers why he/she is in the swamp. As Dusclops was resting in his ball, he sudenly felt the ball opening. "What dark pokemon is this stupid trainer sending me out to get slaughtered by this time?" thought Dusclops to himself. But he realized he wasn't being sen't into battle, he was being released. "What?!? Doesn't he realize how much I enjoy the luxury of a poke ball?" But it was to late, he was already out in the open, and the trainer threw away the poke ball. "What nerves does this kid have? I'll show him mt true power!" Dusclops began slowly walking towards his trainer with aq miscreavious look on his face. Before his trainer could think, he gave him an evil stare, or more simply used mean look. But his trainer noticed his eyes before the look came, and went running towards the agresive pokemon center. "Oh-no, he's trying to get me caught by the wild pokemon catchers! Oh well, I still have one more trick up my sleeve!" As the catchers emerged from the building they were running towards him with speciel ghost pokemon nets. But when they were about to capture him, he vanished into darkness. Repearing on the roof of a building, he decided to take a rest. While he was asleep he felt a presince of humains behind him. Quickly jolting from his sleep to disepear from view again, took to long and the man used the abra that was with him and warping Dusclops away. 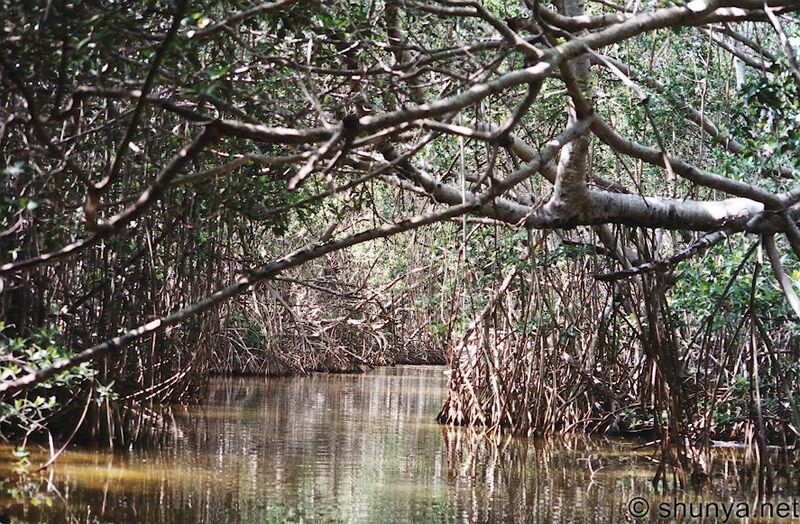 Disclops awoke to fing himself in the middle of a mangrove swamp, with no help when he needed it. Vibrava was owned by a loving trainer who was intended on raising him, but one day on an airplane, the airplane was boarded by robbers who stole everyone's pokemon. The trainer did not want Vibrava to be used for crime, so he dropped the pokeball out the window. The pokeball then fell in the mangrove swamp and broke open. Slayer sat in a quite nice tree and gnawed at a dead remoraid. Shame to kill such a cool creature, but he had to kill something to get food. He threw away the remoraid head, and started looking around himself to find more food. He heard a whistling sound and turned around, just in time to see a pokeball fall out of the sky. It hit the ground and broke, and out came a pokemon. Slayer thought "food..?" and hurried towards the pokemon, sharpening his scythes. Muddy wanted to try to climb a tree to see what's at the top. After a few minutes of failing the tree-climbing he decided "Hey why don't I go the oppsite way!" He wasn't the best digger in the world but he could dig. While Muddy was digging he found a dugtrio. The dugtrio chased Muddy to a dead end and so Muddy slammed his head (Ouch) on the top of dugtrio's little cave and found himself right under Slayer. Muddy quickly traded spots with the dugtrio. After Muddy made sure dugtrio couldn't get to him there was an earthquake and Muddy was trapped by two huge boulders. The top and bottom of the cave was way to thick for him to dig into and those rocks were like steel. Muddy was trapped and couldn't get out without help. Vibrava had only started reganing is strengh after the fall. "Why did he betray me? We were best freinds..." said Vibrava. "And where am I? This isn't a pokemon center, PC box or day care?" Then Vibrava looked down at the swamp's water and saw a broken pokeball. "Could that flying device I was on... did he drop me off it? I... I want to see him again. But he told me that the device was flying to the other side of the region... I'll never see him again..." said Vibrava, looking sad. He decided to look around the place, and then he saw Slayer trying to mud shot a dugtrio. Vibrava quickly jump in front of the dugtrio and hit it with sand tomb. While it was stuck, he crunched down on one of its heads. The dugtrio was stuyned by the blow and started reganing it consinous, but then Vibrava turned around and saw that Slayer was VERY angry. Before I role play I have to note this: By mistake I gave Dusclops disable when I meant to put down confuse ray, so please keep in mind that he now has confuse ray instead of disable. As Dusclops regained his conciousnes he heard a brawl going on below the small cliff he was standing on. They were being attacked by a Dugtrio, so without thinking he rushed to the edge of the ledge and studied its movement. When he found a pattern he confused rayed it and the Dugtrio was digging all over the place from confusion, smacking into a huge rock, causing rocks to fall all over it. He saw that they suddenly all looking in his direction. Quickly thinking, Dusclops once again disappeared into the shadows, out of view. Slayer shoot a mud shot at the dugtrio, who didn't seem to be very damaged. Then he suddenly saw a vibrava attacking the dugtrio. Slayer got the idea that if he let vibrava battle a while, he couls knock out them both easier. He started storing mud from the swamp ground, to shoot out later. Dusclops was startled by a mudkip bumping into him, and without hesitating he unleash a lump of shadows [shadow ball] at it, not knowing it was already KO'd. Now consetrated on the Dugtrio, he quickly unleashed punches that he threw from the shadows, [shadow punch] sending the Dugtrio into a world of pain. We can write "Not roleplay:" before writing something that isn't the actual roleplay. Not roleplay: To answer your question. Guess why trainers tell their pokemon what to do. Pokemon aren't that smart. And i dont think abilities count here, so mud shot is not very effective, but can still cause damage. Not roleplay: Can we have abbilities? Slayer still has water moves to hit Vibrava with. Not roleplay: No.. I dont think so. Quickly alerted by mud shot, Dusclops turned his gaze at slayer. "What was that for?!? If you're a carnevor why are you attacking me?!? If you didn't notice I'm a ghost, no meat in ghost. Anyway, here's a punishment! CONFUSE RAY!" Dusclops unleashed a ball of dizzying light at slayer, hitting him in the face. not roleplay: a lesson i've learned, you cant say that you hit my face, you can say that you aimed at my face! Slayer saw the dusclops firing a weird move against him. He dived into the shallow water to dodge. Vibrava started to wake up in the tree. But then he saw a mudkip walking by. Vibrava was curious about it and flew down the tree in front of it. Vibrava didn't want to hurt it. He just staired into it's eyes, hoping the mudkip wouldn't run away. Muddy did the only thing he knew to do in a sitution like this. Thinking he was about to be killed he just said "...Hi..."